Remove fan shroud and motor assembly. Refer to CO-17, "Component". Remove reservoir hose upper from radiator to water outlet. Refer to CO-15, "Exploded View". Remove вЂњBвЂќ terminal nut and вЂњBвЂќ terminal harness. Remove вЂњSвЂќ terminal nut and вЂњSвЂќ terminal harness. Disconnect harness connector from oil temperature sensor. Refer to EM-94, "Exploded View". Disconnect harness connector (1) from crankshaft position sensor. 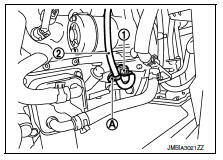 Remove harness clip (A) from oil pan (upper), and then remove harness (2) and set aside. Remove upper starter motor bolt. Remove lower starter motor bolt and remove starter motor. Be careful to tighten "B" terminal nut to the specified torque.